Japan starter Ayami Sato, center, celebrates with catcher Tomomi Nishi after shutting out the United States in the final of the Women’s Baseball World Cup in Miyazaki on Sept. 7. Sato smiles beside the World Cup trophy at the Baseball Hall of Fame and Museum in Bunkyo Ward, Tokyo, last month. Like many other female players, Ayami Sato has once thought of passing on baseball and taking up a different sport. However, Sato couldn’t walk away from the joy she feels when pitching and hitting — and her decision has paid off. 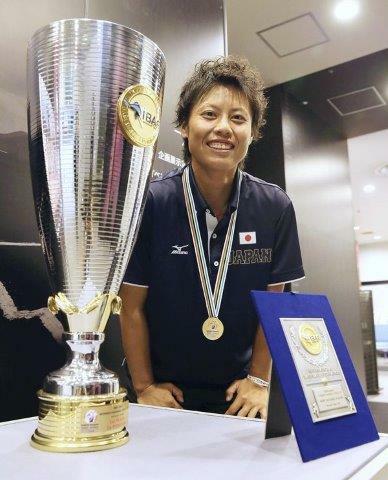 Sato in September was the MVP at the Women’s Baseball World Cup, leading Japan to its fourth consecutive title in the tournament, held in Miyazaki. The 24-year-old right-hander went the distance in the final to shut out the United States in a 3-0 decision. Despite her remarkable performance, winning the final wasn’t easy by any means — Sato took a sharp comebacker off her left ankle in the early stages of the game. However, she didn’t leave the game and there was a good reason she wouldn’t relinquish the mound. Japan and the United States also faced off in the World Cup final two years ago in Canada. During that tournament, Sato saw Shobi University teammate Yukari Isozaki lead the national team as its ace, and was the winning pitcher in the final. Isozaki’s performance inspired Sato. “I thought, ‘I’m going to be the one to pitch next time. I want to be on the mound when Japan wins the tournament,’” Sato said. So even with a stinging pain in her left ankle, Sato never considered leaving the mound. She was also concerned the momentum would shift to the United States if she was replaced. Sato smacked herself on the legs to pump herself up, and continued to pitch. When it was all over, she hadn’t allowed a U.S. player to reach third base. joined the North Reia professional team last year. “In the end, we became the best team we could be, and won a fourth straight title. When entering middle school, however, Sato found there was no baseball club for girls. She instead played basketball, but she always watched the boys practice baseball during breaks in basketball practice. Baseball seemed to be more exciting to her, so Sato finally made up her mind to join the boys’ team in the autumn of that year when third-year students left the club. Sato was the only female member of the team, but she eventually became one of its mainstays, playing third base and hitting fifth or sixth, while also pitching. “We won a city tournament,” Sato recalled. But when she was looking at high schools, Sato faced a difficult choice: continue playing baseball or switch to softball. A move to softball would have given her more options, as there were only about five high schools nationwide with women’s hardball baseball clubs. Sato eventually made up her mind to continue her baseball career after receiving advice from her mother. Fortunately for Sato, there was one high school in Kagoshima Prefecture with a hardball club for girls, so she went to Kamimura Gakuen High School in Ichiki-Kushikino in her native prefecture. Sato’s career on the diamond has been filled with shining moments and blemishes. During her high school career, the pressure had Sato on the verge of a case of the yips, which she was unable to fully control until the summer of her final year. The key moment in her career came during her time at Shobi University in Saitama Prefecture, where she played under coach Hiroshi Shintani, a former Seibu Lions pitcher. The 50-year-old manager changed Sato’s mentality of focusing too much on control, which resulted in a striking reduction in her velocity. “I learned the importance of being aggressive with batters instead of worrying too much about the strike zone,” Sato said. With North Reia, Sato has won the strikeout title the past two seasons. As a professional, Sato said she has established two goals. One is to help make the sport more popular among women — she and her teammates even occasionally distribute leaflets on streets in a bid to lure more spectators to her team’s games. “I’d be happy that even just one more girl starts playing baseball after watching our games,” she said. Her second aim is to throw at least two perfect games. She plans to do all she can to accomplish the feat at least once, and isn’t concerned how she gets the outs. But if she were able to throw a second perfect game, she said her focus would be notching as many strikeouts as she can. “I want to see how much I can win by trying to dominate batters,” Sato said.